Komatsuna, which has the scientific name Brassica rapa var. perviridis which belongs to the Brassica family, is a green, leafy vegetable that is sometimes called Japanese mustard spinach, tendergreen, or mizuna. It is endemic to Korea, Vietnam, Japan, and Taiwan. It got its name from Japan’s Komatsugawa district and is considered a staple in Japanese cuisine. Komatsuna, a biennial, is a leafy form of wild turnip and is an evolved form of pak choi or Chinese cabbage. 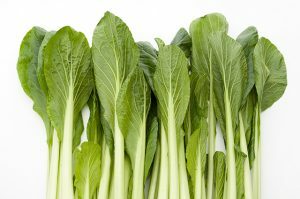 In fact, it is related to bok choy, rapini, turnips, kale, cauliflower, Brussel sprouts, and broccoli. It is very tolerant of hot or cold temperatures, maturing in just around 40 days. It can be grown the whole year round, with peak season fall through spring, and can reach a height of 12 to 18 inches. The komatsuna plant is pretty useful – its flowering stems and tender leaves can be eaten either raw or cooked. It has long, slender stems, and spoon-shaped leaves. Its varieties includes torasan, senposai, summerfest (which best grows during the summer season), and misome. It tastes somewhere between a mustard and cabbage. Komatsuna doesn’t need meticulous gardening care; consistent irrigation, occasional fertilizer, and a weed-free area is enough to ensure its healthy growth. Komatsuna has cancer-fighting abilities. According to the Linus Pauling Institute, komatsuna’s glucosinolate content contributes to a decreased risk of developing cancer by inhibiting the growth of detrimental enzymes. Also, komatsuna’s beta-carotene content protects first-hand smokers from the onset of lung cancer. The vitamin K in komatsuna (350 percent of the recommended daily intake) is important for optimum blood clotting and iron absorption in the body. The vitamin C in komatsuna, which is around 65 percent of the body’s daily recommended allowance, is essential for the synthesis of certain neurotransmitters and collagen, a protein that enhances the abilities of connective tissues and helps heal wounds faster. Iron absorption is also enhanced by vitamin C.
Komatsuna has anti-inflammatory properties. The vitamin K in komatsuna decreases the levels of Interleukin-6, a protein which is said induce inflammation in the body and cause serious illnesses such as coronary heart disease and cancer. Komatsuna is good for the immune system. This is due to the plant’s high vitamin C content. Komatsuna is good for the ocular system. Its beta-carotene content protects the retina of the eye from free radical damage. On the other hand, its lutein and zeaxanthin content (40 percent of the recommended daily intake) helps prevent the onset of age-related disorders such as macular degeneration and loss of central vision. Komatsuna is good for dental health and the skeletal system. Its high vitamin K content can be counted on to facilitate calcium absorption in the body, thus providing for healthy bones and teeth. Komatsuna is good for the cardiovascular system. Its vitamin K content takes care to ensure calcium deposit in bones and not in artery walls, thus preventing atherosclerosis, a condition in which artery wall deposits cause the walls to break down, and thus allowing for the release of such deposits into the bloodstream. Komatsuna also supports the digestive and reproductive systems. Komatsuna’s young leaves can blend with other greens to make a salad, while its more mature leaves can be used in stir-fries. It can be used in spring rolls and pasta dishes. It can be preserved as a pickled vegetable. It also makes a tasteful addition to stews, especially when seasoned with ginger, garlic, and scallion. Komatsuna is great when cooked with smoked meats, sesame, rice wine vinegar, lemon, cream, crab, chili peppers, ham, mirin, miso, salmon, shrimp, soy, tuna, leeks, onions, and sesame or olive oil. It can also be used as a sandwich or burger topping or omelet garnish. Spice them up and saute them any which way you like. Komatsuna is good for the skeletal, cardiovascular, digestive, immune, reproductive, and ocular systems. Komatsuna is good for dental health and blood clotting.